If There's Life on Alien Planet Gliese 581g, How Do We Find It? 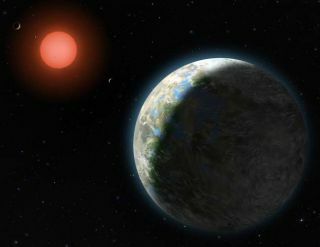 This artist's conception shows the inner four planets of the Gliese 581 system and their host star, a red dwarf only 20 light-years from Earth. The large planet in the foreground is Gliese 581g, whose discovery was announced in September 2010. The planet is in the middle of the star's habitable zone and is only three to four times as massive as Earth.